We launched a fresh look and feel for Global Resource Investments, LTD. just about a year ago to the day today, and after a year, they were ready and eager for more. 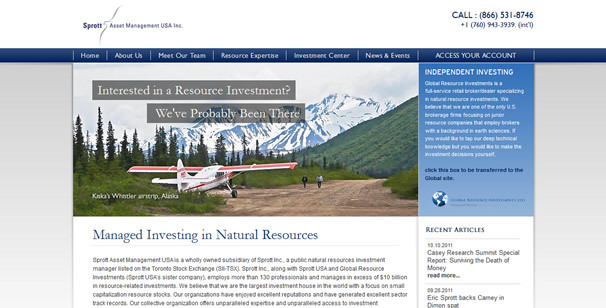 The single site for investing, a year ago, bloomed in to two separate entities this time around : Independent Investing with Sprott Global Resource Investments LTD, and Managed Investing with Sprott Asset Management USA. I am especially pleased with how the Panning Slideshows on the homepages turned out. Based off of an example of a Flash gallery that Travis saw somewhere, this one is all jQuery + CSS on top of WordPress’s wonderful NextGen Gallery plugin. The plugin already has fields to store Alt/Title Text (caption) and Description (text overlay) of each image in a gallery, so we just needed a custom gallery template to pull that in, and some jQuery fancy hand waving tricks to animate the image panning and crossfading. What do you think? A nice bit of improvement? Next PostWhere's the fold? There it is!